And one of the city’s best-known businesses Stokes Tea & Coffee at The Lawn is going to be one of the first to use one of the cycle storage units. A bright green “store” which can fit into a standard car parking space has been installed at The Lawn where Stokes also has an Access Lincoln-approved cycle friendly café. But there’s good news for Lincoln BIG’s other levy payers too – because the Business Improvement Group also has a bright pink bike port which is available for them to use. “We want to send out a clear message that bicycles are more space-efficient than cars and the green bike port is very eye-catching so it should help us spread the word. “Stokes at The Lawn is approved by us as a cycle-friendly café, which offers free water bottle refills and the loan of a bike lock while a cyclist is using the café. Sarah Loftus added that Lincoln BIG’s pink bike port, which can be moved from location to location – and is therefore ideal for use at events – is available for FREE for use by its levy payers for staff, customers and events. All they have to do is get in touch with Alison Mackfall on (01522) 581906. “Stokes is extremely excited to be working in partnership with Lincoln BIG and Access Lincoln, being the first in Lincoln to take delivery of their car bike port. “I am very passionate about helping make the city accessible and encouraging people to get out there on their bikes, keep healthy and enjoy the outdoors. 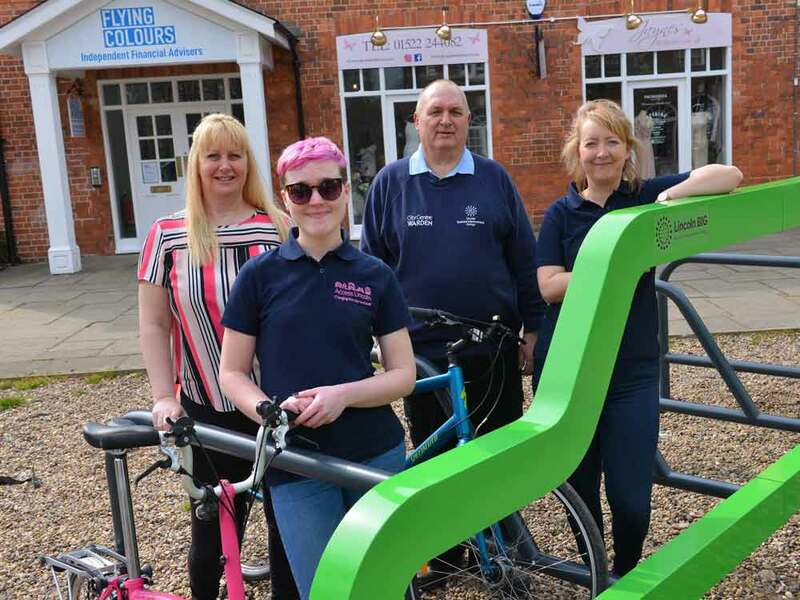 “Working in partnership with Lincoln BIG and Access Lincoln is a great collaboration for Stokes, and these striking bike stands will allow people to secure their bikes whilst enjoying our facilities at The Lawn and the surrounding Bailgate area.